So, here we are then. It’s been four years today since the awful day that Speedo died. Forty-eight months down the line, and where has the time gone? It seems like five minutes since, driving to my parents house after running a few errands, the bleak words came out of the car radio and fell like a hail of rocks into my unwilling mind. Gary Speed – that smiling boy, that shock of dark hair, the towering presence in attack and all over the park in the white shirt of Leeds United, our home-grown and beloved Speedo – was dead, and apparently by his own hand. It’s no exaggeration to say that this was a “JFK moment”, one where you’d forever remember where you were and what you were doing when the shocking blow fell. What about you? What were you doing when you heard that Gary Speed was dead? We remember him in many different ways. He was an exuberant quarter of that magnificent United midfield of a quarter-century ago. It was the best around, the engine room of the early nineties United team that swaggered back into the First Division after an eight year absence, had a little look around, decided that “there were nowt to fear” – and won the League in 1992, by four clear points. Decent at the back, productive up front, that team was powered by the four guys in the middle of the park; energetic leader Gordon Strachan, robust and implacable David Batty, elegant and creative Gary MacAllister – and, of course, the late, great Gary Speed. What can we possibly say of Speedo that will give us the remotest chance of doing his memory justice? Bursting from his own half to score that fourth, decisive, hammer-blow goal against Sheffield Utd when we were battling each other for promotion and the second division title in 1990 – “Go on, Gary lad, get one yourself, son. And he has!” Leaping salmon-like in that favoured inside-left channel (as we old’uns used to call it) – meeting accurate long diagonal passes to head dangerously goalwards for the likes of Chappy, Shutt, Varadi, Wallace – even Cantona… Blasting home from thirty yards against Southampton at the Dell, volleying in at the South Stand against Stuttgart and Man U, powering home a header at Crystal Palace, arm raised in salute, broadly grinning as he celebrated another goal for Leeds United – and always, always doing his bit for that fabulous midfield foursome. Ridiculously good-looking was the boy Gary, a real pin-up type with the artfully-tousled hair, the chiselled bone structure and the hundred megawatt smile – and yet the kind of down-to-earth lad you didn’t mind your girlfriend fancying, or perhaps your daughter bringing home. In fact, it gave you that warm glow of affirmation – she fancies our Speedo. None of that Giggsy rubbish. You didn’t just not mind – you were flattered, by proxy. Greater love hath no fan. If you had told me in 1992, when we saw that great midfield play and win, going on to collect that historic last-ever Football League Championship trophy, that a mere 19 years later we’d see three of them gather again to lay a wreath for the fourth – I’d never have believed something so awful could happen. It would have seemed like a sick, horrible, unfunny joke. Back then, it was still five years before we would lose Billy Bremner, twelve before we would say goodbye to another iconic Welsh hero, Gentle Giant and fifties legend John Charles. Three years earlier we had shed tears in isolation as Don Revie succumbed to motor neurone disease, and most of football stood by indifferently save for his glory, glory boys and a select few others. It seemed, back in 1992, that losing the Don would be enough of sorrow and grieving for a long time. The Super Leeds side were all still alive and kicking, and we had this new team of Champions to salute. They were happy days; we were all that much younger and more innocent then. It’s a good job that you can’t see what’s coming at you, just around the corner. Gary Speed holds a place still in the hearts of football fans everywhere, but especially perhaps in his adopted West Yorkshire home. 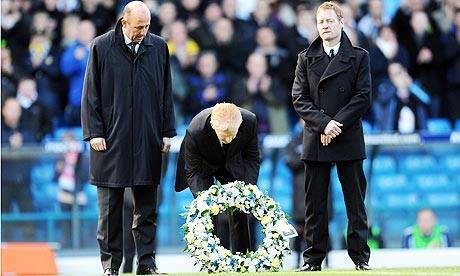 That much is evidenced by the depth and sincerity of the tributes that have been paid to him by Leeds United, the club and even more so the fans, since that tragic day four years ago. In the very next game after Gary’s death, the travelling army of Leeds fans at Nottingham Forest chanted his name from the 11th minute, for 11 minutes, for our former number 11. It was a chant broken only briefly by ear-shattering celebrations as the modern Leeds team scored the opening goal. They went on to win 4-0 with a dominant performance. It was that kind of evening; they dared do no less. But Gary had other fans, in other clubs – he was a boyhood Evertonian and had a spell at Goodison Park from 1996. That didn’t work out too happily in the end, but he served his childhood favourites well. The reasons underlying Speed’s departure from the Toffees were never revealed. He told the Liverpool Echo: “You know why I’m leaving, but I can’t explain myself publicly because it would damage the good name of Everton Football Club and I’m not prepared to do that.” On he moved to Newcastle and found a new legion of adoring fans, appearing in two successive FA Cup Finals for the Toon. He served Bolton Wanderers with distinction as player and coach and finished up as a player and then coach at Sheffield United – almost full circle from that match-clinching goal he’d scored against the Blades in 1990. Then of course he went on to manage Wales and, proud Welshman and distinguished international footballer that he was, he was making a fantastic success of that job, putting pride and passion back into the Red Dragon. His last game in charge was a 4-1 friendly success over a classy Norway team on 12th November 2011 – and that sadly was Gary’s final curtain. But a few weeks after his death, on 21 December 2011, the day of the final FIFA rankings of the year, Wales were awarded the title of ‘Best Movers’, having gained more ranking points than any other nation in 2011. A fitting tribute to the impact a talented young coach was having in his tragically brief spell in charge of his country’s national squad. Since then, of course, Wales have qualified for Euro ’16, their first major tournament in well over half a century. They did it by building on the solid foundations laid by Gary Speed. 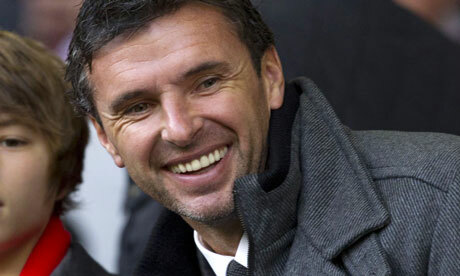 Four years ago today since the tragic death of Gary Speed. Four years without one of the first of my Leeds United heroes to be younger than I was when he starred in the Whites first team. He was a novelty – I’d always looked up to men older than me in the white shirt, and worshipped them as a boy does a man. But Gary was “nobbut a lad” to me, someone I looked up to whilst realising I was beginning to get old myself. He’s a lad to me still, four years after we lost him. We’ll never know what was in Gary Speed’s mind on that awful day in 2011. It remains shrouded in mystery, and all we can tell ourselves now is, it was so needless, so unnecessary. Someone who had helped as many people as Speedo did in the course of a long and distinguished career, must surely have known that, at need, there would have been help for him. People would have been queuing up to help him, surely. If the days of unbelieving sorrow immediately after his death showed anything – they showed that here was a man loved by his peers and by his fans in a way that very few have been, before or since. I wonder if he really knew that? We can only hope he did. Ask any football fan to tell you who in their opinion was the greatest British footballer ever, and you’ll get a variety of answers. Danny Blanchflower, Tom Finney, George Best, Duncan Edwards, Dave Mackay, Billy Bremner, Kenny Dalglish, Paul Gascoigne – and many, many more, some with reasonable claims for recognition, others less so. Probably most will go for Best, partly because of the hype that surrounds the self-proclaimed Greatest Club in the World and partly because Best himself wasn’t shy about telling everyone he was the best ever, anywhere, which must have given World Cup Winners Zidane and Maradona slight cases of mirth-induced hiccups. The claims of Best tend to be perpetuated by the media, who have their own agenda when proclaiming superlatives about the game, especially these days when markets are so important and merchandise-buying fans must be kept happy. So we hear that Man U are the biggest/greatest, that Old Trafford, the Theatre of Hollow Myths itself, is the finest ground this side of Betelgeuse, that the Busby Babes were going to be the greatest team in all four dimensions for ever and ever – and that Best was, well, the Best. It’s a self-perpetuating myth that glosses lightly over George’s many faults: his predilection for taking the field in important semi-finals tired and emotional as a newt, or not-so-fresh from some young strumpet’s bed; his dislike of discipline and inconveniences such as training; his waste of a massive natural talent upon early retirement and then a succession of ever more embarrassing comebacks. This was the greatest player ever? Really?? What does the word “great” mean, exactly? If you ask a Juventus fan of a certain age, he’d probably have a pretty unanswerable argument to put for the unparalleled greatness of William John Charles (1931 – 2004). Proud Welshman Charles shone for several seasons in the top two leagues of the English game with Leeds United before a then British record fee of £65,000 was enough to take him to Italy. There he scored on his debut for Juventus and never really looked back, performing with such masterly grace, skill, power and sportsmanship that the Juve fans took him to heart forever, dubbing him il Gigante Buono – The Gentle Giant. In 1997, Charles was voted by fans of the Italian game as “best-ever foreign import” – this over and above the likes of Platini, Maradona, Law, Rush, Sivori, Gullit and Zidane (who had been at Juventus a year when the vote was taken). For a player to be deemed the best ever in that sort of company, and well over 30 years after he had left Italy into the bargain, argues for a truly special, unique performer, someone who possessed very great gifts indeed. Those tifosi know their football, after all – and in Charles they knew they had a world-class centre-half and a world-class centre-forward, all wrapped up in one modest and loveable package. Who else embodied skill, strength, temperament, courage better than the Gentle Giant, a man described by the Juve club doctor after his transfer medical as “quite the most perfect human machine I have ever seen”? John Charles was all that, and so much more besides. He has been described as being simultaneously the best defender and best attacker in the world, blessed with heading power to surpass many a player’s shooting ability, a rocket shot in either foot, an incredible physique and amazing skill on the floor, especially for such a big and powerful man. In the whole of his career, encompassing all those seasons in the physical battleground of Serie A, he was never once sent off, nor even cautioned. That is perhaps even his greatest achievement, considering the attention paid to trying to mark him out of his attacking contribution – and yet Charles’ spell with Juventus was so honour-laden that he carried home many tangible rewards also. His spell at Juventus must count as the John Charles heyday, although he had enjoyed considerable success in a mediocre team at Leeds United. Several goal-scoring records fell to the giant Welshman during his first and most productive spell at Elland Road, and yet he’d had a long spell as a central defender, another position in which he was a truly daunting opponent. Leeds were sometimes nicknamed “John Charles United” at this period of their history and none who saw him play doubted that here was the finest footballer in the world. It was the versatility of Charles, his ability to excel in two such different positions, stopping attacks and scoring goals with equally deadly proficiency, that made him such a valuable asset to any team he played for. In 1958, Wales came as close as they ever would to World Cup glory, falling only to Brazil in a match for which Charles was injured – the deciding goal in a 1-0 defeat being scored by a young lad known simply as Pelé. To this day, Welsh supporters wonder what might have been had John Charles been available for that game. The phenomenal Welshman was a potential match-winner against any opposition. John Charles died in 2004 after a prolonged spell of ill health. My dad remains one of his biggest fans and due to this I got to meet him a few times – a more likeable, self-deprecating and gentle man it would be hard to imagine. For him to declare himself the Greatest is impossible to imagine. That sort of thing is for someone who’s indisputably the best around and a showman too – the likes of Muhammed Ali. And examples of flawed genius like Georgie Best, that doomed Belfast boy, they might come out with such immodesty as well – but that sort of blarney can’t hide the truth about genuine, five-star greatness. I went to Elland Road to see John’s funeral cortège complete one solemn, dignified circuit of the pitch as thousands stood in silent tribute to the King. He had his greatest years on foreign soil and became a world star, but he always came back to Leeds, his adopted home, where he was loved and revered in equal measure. Greatness isn’t just snake-hipped skill, it isn’t just about wonderful goals and flashes of brilliance that might make you forget for a while the drink and the women and the missed training sessions – the wasted years. That is the tragedy of Georgie Best. Greatness belongs to a different magnitude of star, one who rises literally and metaphorically above all others, encompassing skill, power, dedication, athleticism modesty, respect for opponent and team-mate alike. That was the greatness of John Charles CBE, hero of Leeds United, Juventus and Wales. The sadness is that, in these glitzy, Murdoch-funded, money-obsessed days, you rarely hear the name of Charles mentioned when the greats are discussed – maybe just a passing reference here and there. Some of his contemporaries still get the plaudits – Jimmy Greaves, Nat Lofthouse, the tragic Duncan Edwards, who may well have developed into a player the equal of Charles. Perhaps John himself is tainted, in the eyes of the chattering classes, by association with what they will always see as “The Damned United” – and doomed therefore along with Don Revie and all of his greats to be left out of the reckoning when hypocrites gather to compare memories. That is indeed regrettable, but it’s a part of the modern condition that, just as the media need heroes to shove down our eager, consuming throats, so they need a pantomime villain – and just as the former will always be Man U, the latter is always going to be Leeds, whatever those of us who know better might argue. So let them have their skewed discussions, their little lists of greats, their exclusive club of what they deem acceptable in the history of the game. It’s a fools’ paradise they inhabit, and just as we Leeds fans can nod wisely and tell them all exactly which was the finest English club side of all time, so we can identify the greatest British player. John Charles, il Gigante Buono, King John. Simply the best.